The first Bryant School on the present school grounds was built in December 1918 on what is now the southwest corner of the playfield. It was one of four “Liberty Buildings” erected by the school district during World War I. Arising from the conflicting pressures of a growing population and the need to conserve materials and labor for the war effort, these six-room wooden buildings cost about $11,000 each, were heated only by a stove in each room, and lacked indoor plumbing. This 1918 building was named for William Cullen Bryant, a 19th century writer and patron of arts and letters. Perhaps best known for his poem, Thanatopsis, written when he was 17, he was editor of the New York Evening Post for several decades in the late 1800s. Spare and intended to be temporary, the new school was still a big improvement over the two-room Yesler School (one room for girls, one for boys) which the students and teachers had previously occupied. The Yesler School had been just south of Calvary Cemetery, near what is now N.E. 47th Street and 36th Avenue N.E. 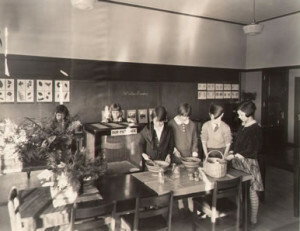 By 1923, to accommodate the area’s continued growth, eight portables had been added and enrollment had risen from about 250 in 1918-19 to more than 400. Originally, grades one through six attended this school, but it soon expanded to include seventh and eighth grade. In February 1926, construction of a new brick building was begun and completed in August of that year. Designed by the school district’s third architect, Floyd Naramore, Bryant is an example of Georgian style architecture of the schools constructed during the 1920s. It has a flat roof with raised parapets, and is faced with red brick with terra cotta detailing. Bryant, like the other schools of this period, incorporated many features that were then new to school design. Among these were combination assembly-lunchrooms, available to the community for public meetings; covered, open-air playcourts; specialized staff rooms and offices, such as a nurse’s station; and linear extensions of buildings, with long corridors flanked by classrooms. 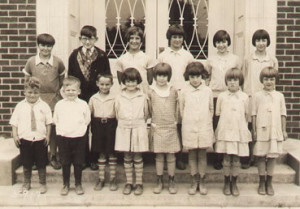 In 1930, the year the first kindergarteners were enrolled, the student population exceeded planned capacity. In 1931, the east wing, which had also been designed by Floyd Naramore, was constructed. This wing added twelve more classrooms, including two kindergartens, plus a larger gym. The front doors, which used to have the same ornamental design as the transom above them, were changed, possibly sometime in the 1940s. Throughout the 1930s, Bryant’s enrollment stayed fairly steady at between 900 and 1,000 pupils in grades kindergarten through eight. The P.T.A. was very active and committed to a wide range of school and community needs. The rapid growth seen throughout the country during the post-war years was reflected in the northeast section of Seattle. By 1948-49, enrollment was over 1400 pupils in grades kindergarten through eight. When Eckstein Junior High School opened in 1950 for 7th and 8th grades, Bryant’s enrollment dropped to about 1200, but two years later had climbed back to over 1400 again. The opening of Wedgwood School in 1953 and Sand Point School in 1956 helped relieve the crowded conditions at Bryant. By 1959, the student population was down to around 900, where it remained through much of the 1960s. By 1970, times had changed substantially. The P.T.A. newsletter, now called the Bryant Byline, reflected concerns about Seattle’s proposed desegregation plan. The February 4, 1971 issue of the Byline announced that Bryant had been paired with T.T. Minor Elementary, “to establish voluntary exchanges.” In another sign of the times, principal James McAuliffe, writing in the March ’71 issue of the Byline on the subject of determining student needs, comments that “the coming of Sesame Street had altered our kindergarten program, which in turn will cause a chain reaction for the next six” grades. In 1971, Bryant became a K-5 school, with sixth grade students assigned to Eckstein Middle School. By that fall, enrollment had dropped from about 800 in 1970 to around 500. Also in the fall of 1972, Bryant became an “exemplary basic skills center” and a “language-learning disability” center for north-end schools. In 1978, it became a K-2 school, with our third through fifth graders attending T.T. Minor. In a story about Bryant on April 22, 1987, the University Herald described the school as having “240 pupils in kindergarten through second grade and 70 to 20 bilingual students. It is paired with T.T. Minor Elementary, has a science course and offers a Horizon program for gifted students.” In 1989, along with other Seattle public elementary schools, Bryant returned to being a kindergarten through fifth grade program. School Histories, Seattle Public Schools, 1951, 1961, and 1974 editions. Seattle Public Schools Historic Building Survey, prepared for Historic Seattle Preservation and Development Authority, 1989. Bryant Barker and Bryant Byline, P.T.A. newslettters from 1961 through 1978. Seattle School District Enrollment records for Bryant School.